Before talking about the portals and programs for building a family tree – those available both on the Internet and possible to be installed on a computer, it is worth passing a few words about what connects them, namely GEDCOM. It is very important to remember that when we create a tree and save it in the GEDCOM format by trying one program, it will be easy for us to transfer it to any other one. 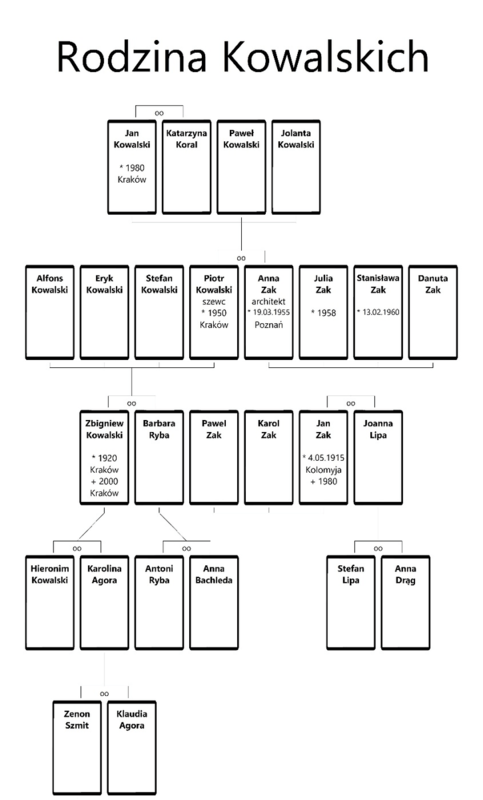 Collecting genealogical information about your family, it is usually quite late reflection to store and organize it as part of a genealogy program – information base. And it is the organization of that data at the earliest stages of discovering a family history that may be necessary to be able to move freely among hundreds or thousands of entries about our ancestors in the future. 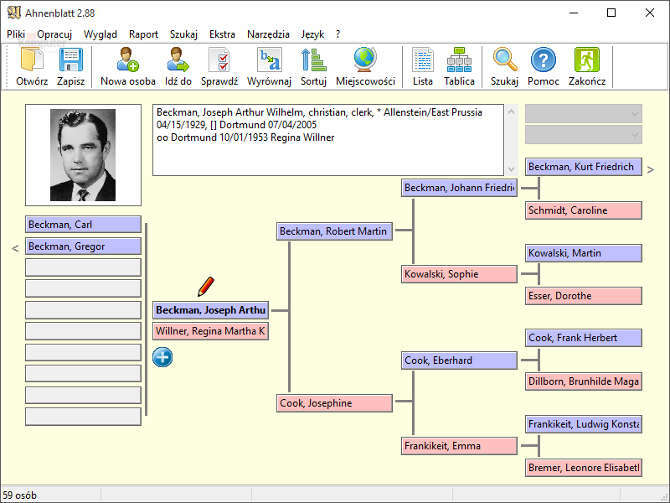 Programs and genealogical portals also give the opportunity to generate a graphical version of the family tree, thanks to which it will be easier for us to present it to the family history or explain complicated relationships. What programs to use? 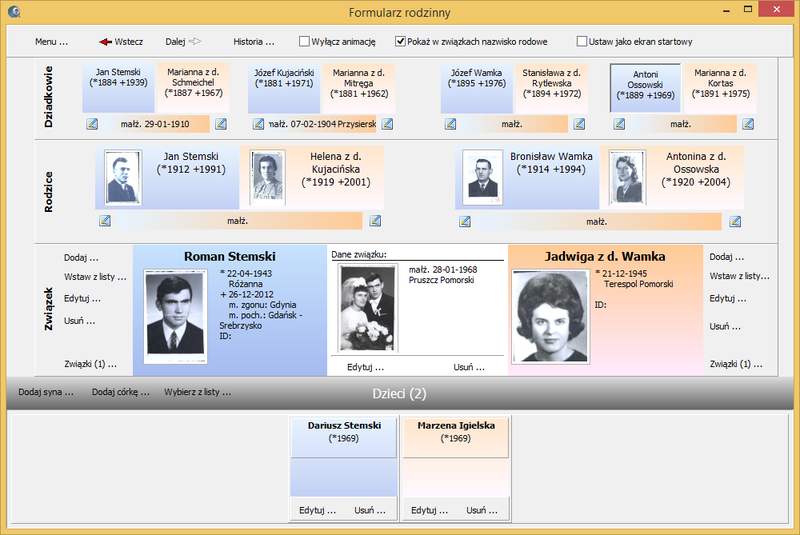 Below there are some suggestions from our side as polish users, so from polish genealogy point of view. 1. Ancestry.com – probably the most popular online genealogy portal on the web. You can create your family tree here, as well as store family documents or family photos. In addition, as part of the portal, one of the largest databases of digitized documents in the world (about 20 billion scans) can be used. These materials are primarily associated with the residents of the United States, but slowly spread throughout the world. We can also search for documents from Australia, Great Britain and China; there are also materials from Poland. Here, too, we can order a genealogical DNA test that will compare its results with the data we have entered into our family tree – within this portal. An interesting tool of the portal is the so-called smart match. This function consists in the fact that if the portal detects information or parts of a tree that is identical or similar with other users – it will inform us about it. Thanks to this we will have the opportunity to contact closer or further relatives, as well as to supplement information about our ancestors that are in the bases of other family members. Currently, around 100 million trees have been introduced into the portal – this number may raise serious hopes for new finds. Working with ancestry.com, we also use hints. Thanks to this tool, the portal compares the data of people entered into our family tree with the documentation stored in the ancestry.com resource. If it finds a link, it informs us about the possibility of assigning new documents to the history of our ancestor. Ancestry.com with all its functions is also available as a phone app. Nevertheless the portal is not free of charge. After 2 weeks of the free trial period, the option of further use is payable (monthly – 35 USD or an annual subscription – 149 USD) – in case of international user. The basic version gives the possibility of introducing up to 250 people on a tree. Admittedly, as mentioned above, there is the smart matches function, but without buying a premium version, we are not able to contact the administrator of the tree with which we have connections with. The subscription is annual, and the prices are up to around 10 USD/ month. My heritage has its own mobile version, as well as – off line, more about it in the second part of the article. 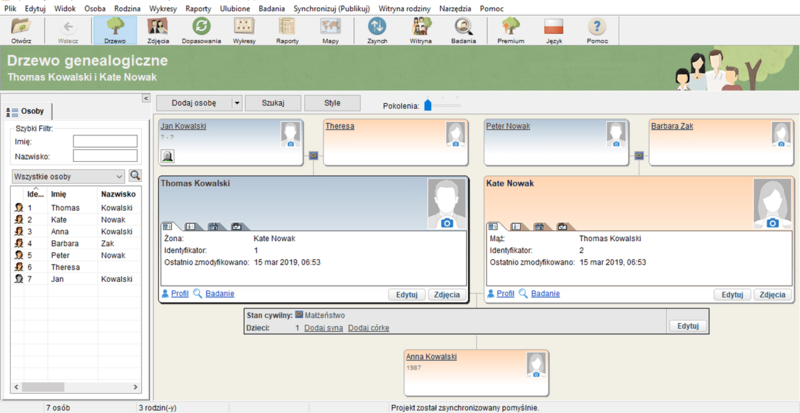 Drzewo genealogiczne 2.0 – program highly rated by Polish users. According to the authors, it is recommended for intermediate and advanced genealogists. One of the most important advantages of the program is service in Polish, as well as the possibility of transparent presentation of complicated family affinities. The demo version gives the possibility of introducing up to 50 people. The full, paid license is 200 PLN (once). Family Tree Builder – created by the above mentioned MyHeritage. Probably one of the most popular programs of this type in the world. It supports content in 40 languages – including Polish. An important aspect is also the ability to synchronize the tree with an account created online. It includes, among other things, the ability to add photos, documents and videos, and organize them in albums, as well as the task wizard. It is equipped with face recognition technology in pictures, as well as in the function of creating reports and charts. An interesting tool is also allowing the location of people on the map on the tree. By deciding to synchronize the program with an online account, you can use Smart Matching. In addition, there is so-called Smart Research – comparing our family tree in one hundred other online genealogy sites. Of course, there are many more programs and genealogical portals on the market – we can use, among others, Brother’s keeper, My Family Tree, Family Tree Maker, Personal Ancestral File (PAF) – a program created by FamilySearch.com, GenoPro, Legacy Family Tree, Find My Past, Family Historian, or Family Tree Now. Everyone will surely find the application in line with their expectations. In our opinion, we believe that the simpler the better. It is also worth knowing too that you shouldn’t be too afraid of building your genealogical tree on – line. Internet portals give the possibility of limiting or removing the access to our family information at all by third parties. On the other hand, the data that we place on the Internet will be protected against the likelihood of losing them as a result of damage to the physical memory of the computer. The most important is to create a GEDCOM file – this will give us the opportunity to verify any programs, avoiding the need to enter the same information once again.